Last Friday we flew out from Heathrow early in the morning, to Vienna. We had been there a few years ago, for the Christmas markets, and decided that we wanted to go back in warmer weather to enjoy all the parks, so it seemed a great place to start out trip. It was totally baking though- they were having a heatwave so heading to a city didn’t seem quite so appealing! Luckily the places we visited had lots of parks to wander around, and plenty of places selling cold drinks! 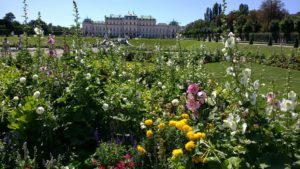 The (free) gardens of the Schonbrunn Palace- a perfect place for an evening picnic with views of the gardens, palace and then Vienna. Admiring the plants (hollyhocks are my favourite) in another palace in Vienna. I didn’t take a photo (I really wish I did) of my delicious salad bowl from Freshii as it was totally made to be on Instagram- I had a bowl of salad with almonds, beetroot, goats cheese, mango, some other stuff- (you could add tofu but it was filling enough as it was)- instead of having it all mixed in, each section of the bowl had a different ingredient so the colours stood out. But I was hungry. After a couple of days in Vienna we got the train to Salzberg- I’d never been before but have always thought it looked good. A walk by the river into the old town was very scenic. 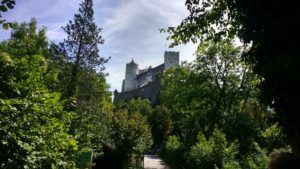 Views of one of the many castles in Salzberg from a slightly cooler walk in the woods. Mozart cake (the town is either obsessed with Sound of Music stuff, or Mozart stuff- any cake with hazelnuts and pistachio marzipan is a winner in my book, and we actually had a piece each instead of sharing, plus it was topped with a piece of Mozart ball, which is basically chocolate made with praline and marzipan). 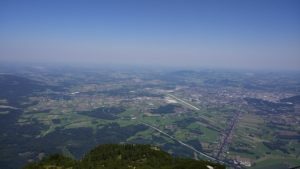 Views of the Austrian and German countryside from the top of Untesberg cable car (we got a pass for the day that included buses, the cable car, another palace which was something else to do with the Sound of Music, museums etc.). 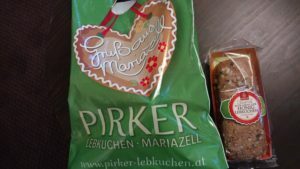 Delicious soft gingerbread from the Pirker gingerbread shop (as it comes from Mariazell it is only right that I would love it so much)- so many to choose from and in the end we went for one with a filling of marzipan and nuts. It was amazing. Off to see if they deliver to the UK…. We managed to beat the 11,000 steps per day pretty easily- on the day of our train journey it was “just” 14,000, but one day in Salzberg was over 25,000 so we were on our feet for most of the day. After that we headed to Germany, but I’ll save that for another day. 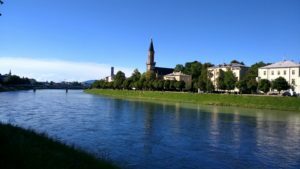 Have you been to Austria? 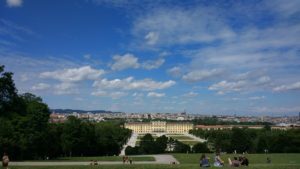 As my Grandma was Austrian, we used to go and visit family a lot when I was little, but my trip to Vienna was the first visit as an adult. Do you like to walk a lot when you are sightseeing? I much prefer it to a sightseeing bus as it means I can take my time (or not) and pop into places that take my fancy. It looks so beautiful. I’ve never visited Austria (and if I’m honest, I know I would have to disappear into the hills and give it the full Maria von Trapp spinning around like in the opening of the film lol!). I like a combination of walking and those hop on, hop off buses. They can be quite good to help you get your bearings and spot things you would like to explore in more detail. I would then aim to return there on foot to soak up the atmosphere. I think we heard someone singing one of the songs pretty much every day- you wouldn’t be alone there at all! I had a funny feeling it might be a popular pastime lol! Ahh Mariazell! That’s so close to where the MT run camp was – and yes it was all about the gingerbread (and honey). Sounds lovely! 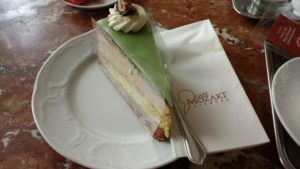 And yes to the Mozart cake – I had that too. So tasty. We have added that to our list of places to visit when we have a car over there- the best gingerbread! I think any city will seem not so good after spending time in the mountains- they are of course better than a hot and busy place, but it did have lots of lovely parks and gardens.